We think this is the best-ever avocado toast – perfect for lazy Sunday mornings. If the sun is shining, enjoy al fresco. 1. Coarsely mash the avocado with a fork. Mix in the lime juice, salad onion and chilli flakes. Cover and set aside. 2. Bring a large pan of water to the boil over a high heat and add the vinegar. Crack each egg into a small bowl, then carefully slide into the water. Simmer very gently for 3-4 minutes before removing with a slotted spoon. 3. 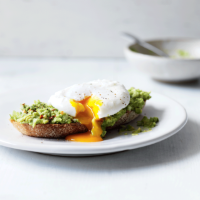 Meanwhile, spread the mashed avocado over the toast and top each slice with a poached egg. Grind over a little black pepper and serve straight away. Cook’s tipTry adding chopped herbs such as coriander or mint to the avocado mix for an extra burst of flavour.